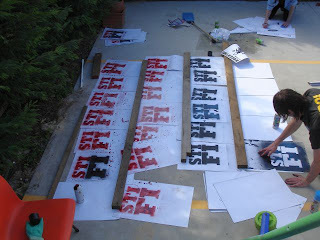 Pat, beaks, neil and kane spent the day spraying new posters for the upcoming onslaught on the east coast and melbourne. will be headin up to newcastle on the 30th of september, then hitten up Port Maquarie on the 1st supporting BOB LOG. Then were finishing on the 2nd in Byron Bay at the great northern. Then headin down to melbourne on the 14th to play the Baha and then the Espy on the 15th. Lock up ya daughter it's gonna get sticky YEOWZAAAA!